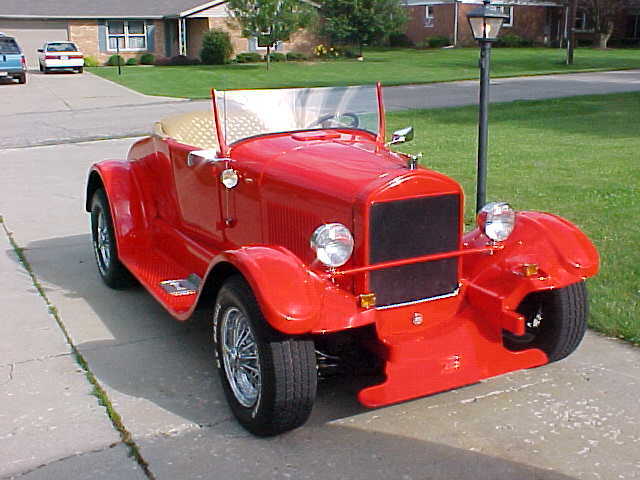 I hope you enjoy viewing the photos of my 1926 Model T Roadster. When I first purchased the car, it was basically complete, but after getting it back home, I began to make some alterations to it. I was not satisfied with the customized hardtop that had been added to the original body. It made the car seem taller and I wanted it to have the look of a true street rod roadster. The top was discarded. This car was first created in by Henry Ford in 1926. Then several years later, Charles King of Patterson, Missouri found the car sitting in a farmer's field and spent the next 8 years rebuilding the car into a streetrod. After removing the add-on hard top, I reworked the ignition system, replaced the entire pulley and belt system for better alignment and eliminate some vibration. I removed the chrome horns and chrome filler strips between all of the body sections. I wanted the car to look lean and clean. Finally, I repainted the car with Dupont's Viper Red. Not sure you can get any redder than this. The car is powered by a 350 small block chevy 4 bbl. Mustang rack and pinion, T350 chevy automatic transmission, Cadallic rear end, 4 wheel disc brakes, ladder bars and spoked chrome wheels. Keep Visiting this Site to see What's New? I will try to keep this page updated so you can see the progress of any future changes I make to the car.